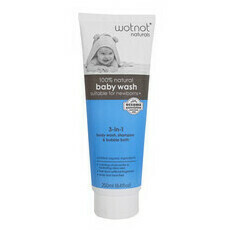 Developed by mums, WOTNOT's Baby Lotion is a truly natural, gentle lotion for your little one's delicate skin. Enriched with certified organic flaxseed oil, one of nature's richest sources of omega-3 and omega-6, it will deeply moisturise the skin with its velvety, non-greasy texture. 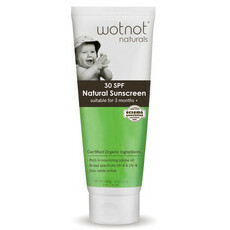 This, along with added certified GMO-free Vitamin E, ensures that your baby’s skin is gently nourished and soothed from the outside in. Made in Australia. Australian Owned. 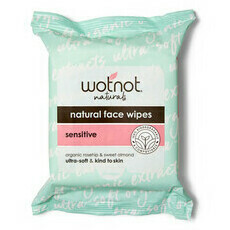 Certified Cruelty Free & Vegan. Gluten Free. Aloe Vera, Chamomile, Olive Oil, Shea Butter. 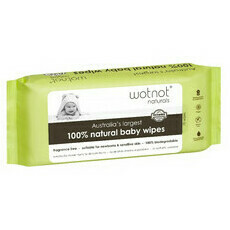 Apply liberally to baby's skin after a bath.